Tail is 1 ¼ - 1 ½ the length of the hook shank. 1. Build a thread foundation down the length of the hook shank and position the eye about 3/16” from the hook eye. Securely lash the eye to the top of the hook shank using figure 8 thread wraps. Advance the thread to the hook point. 2. Tie in the craft fur tail just above the hook point, and add three narrow black vertical bands on the tail. 3. Above the hook point, tie in the brown saddle hackle. This will be palmer-wound up the hook shank at a later step. Select a hackle that has barbules at least as long as the width of the hook gap. Ensure that they’re about ¼” or more because they’ll be trimmed at the end of the tying procedure. 4. Tie in the tan yarn and advance the tying thread to the hook eye. Wind the thread to the eye and tie off securely. 5. 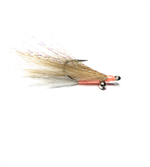 Palmer-wind the tan hackle up the hook shank, toward the eye. Use even spacing and brush back the hackle fibers as you go. Tie off securely. 6. 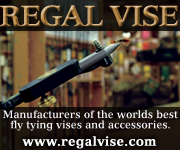 Trim the hackle all around the fly – leaving the hackle as long as the gap of the hook – about ¼”.